APO Volunteer University is the Fraternity’s NEW graduate school designed especially for alumni and volunteers. The program is broken down into eight colleges or tracks, each aimed at the needs of various volunteers within the Fraternity. Complete five courses in any track to complete the track and receive recognition (a frame-able certificate, recognition in the T&T and an announcement to your sectional chair and regional chair). Each track will have 5-8 courses/workshops from which to choose. How do I complete a track? Alpha Phi Omega is only as strong as its volunteers. Without volunteers, Alpha Phi Omega would not exist. It is important that volunteers have the skills and support needed to get the job done well. If you would like to serve the Fraternity, then APO University is for you. That’s what Alpha Phi Omega gets – a valuable, well-trained volunteer staff. What do you get? You get the knowledge that you have the skills and information to do your job within the Fraternity well. Those who fully complete tracks (five courses) will receive a certificate of completion, recognition in Torch & Trefoil magazine, and a letter of congratulations sent to their regional chair and sectional chair. We suggest that all volunteers begin with the Essentials of APO Volunteering track. This is a nice entry track for all volunteers. Next, decide what kind of work you would like to do or already do in Alpha Phi Omega. Chapter liaisons and sectional chairs might want to take the Chapter Support track next. Those serving on regional or national program committees may want to take the Program Support track. You complete a track by successfully completing five courses in that track (most tracks have between five-eight courses to choose from). Some of these courses are existing APO IMPACT courses. Others are developed as face-to-face workshops that can be delivered at a sectional or regional conference. The National Volunteer Conference (NVC) is also a great place to complete a track. Eventually, most of the workshops will be converted to online courses to make them as accessible as possible to the entire volunteer population. How do I locate courses? Talk to your sectional chair or regional chair about hosting a course or a track at a local conference. Also, note that the National Volunteer Conference will give you the opportunity to choose from three different tracks (as well as courses from some uncompleted tracks) to complete in one weekend. 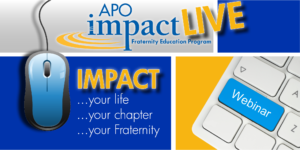 Additionally, several APO IMPACT Live webinars count towards APO Volunteer University credit. At the end of each APO Volunteer University course you will receive a specific course code. In order to receive credit for participating in this course, you will need to enter the four digit code on the screen into the APO Online Learning Center course assessment. Please save this code in a safe location. Details for accessing the APO Online Learning Center will be sent to all attendees via email approximately 7 to 10 business days following the presentation, with detailed instructions. If you already have a login for the APO Online Learning Center that you used after the 2014 National Convention or the National Volunteer Course, you can go ahead and login using your already established username and password. If you do not remember your login information or did not receive the instructional email, please contact Stacey Robinson, Director of Chapter Services, at [email protected]. Each user will have two chances to select the correct code in the assessment. Once the correct code is selected, you should see “Passed” in green on the final assessment status screen. APO Volunteer University face-to-face courses/workshops are available for re-delivery at sectional and regional conferences. To receive the presentations, handouts and supporting materials, complete the APO Volunteer University Course Request Form. By completing this form, you are agreeing to submit a roster of attendees and provide feedback to the Internal Volunteer Development Committee on the quality of the course APO Volunteer University Presenter Survey.